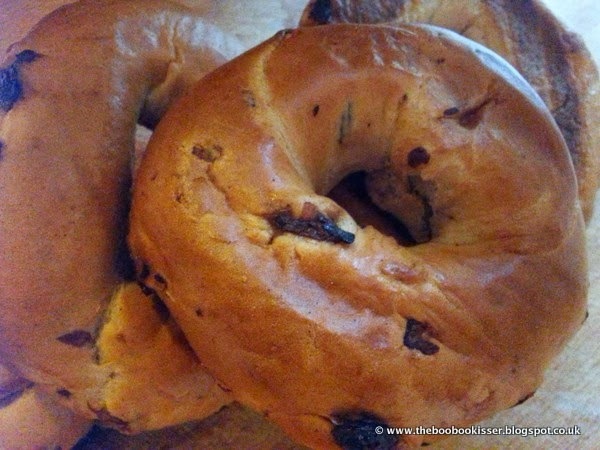 I was stuck with a dry batch of rather tasteless bagels bought from a local supermarket. I care too much about food, or the lack of it in parts of the world, to let a perfectly digestible, but utterly unpalatable bunch of bagels go into the recycling bin. There had to be something I could do with them. I am no masterchef. And I am no food blogger. What I am is a Mum with a tot who loves his puds. A Mum who likes to whip up scrumptiousness in her kitchen with minimum effort. 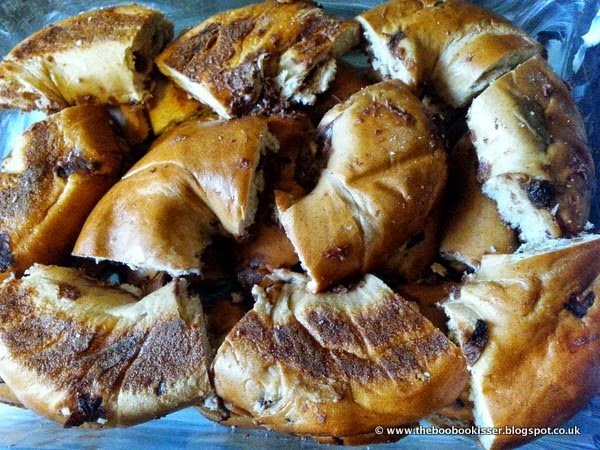 So what becomes of said bagels? 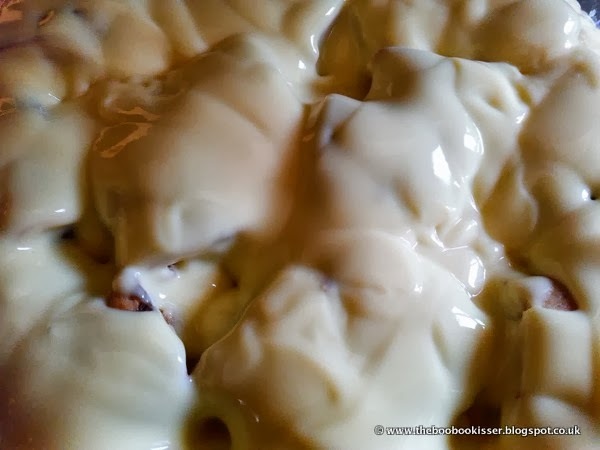 They get transformed into a bread and butter pudding. With a twist. A very Nutella twist! - a carton of ready-to-use, shop-bought, full-fat custard. No, I am not ashamed to confess to any of that. All the bagels got halved. Each half got generously lathered with a layer of Nutella. The bagels were reassembled, then quartered. I do not have a proper baking dish at home. Not yet, anyway. So I opted to use one of my collection of Pyrex glass containers sans its plastic lid. The product description says it is safe to use in the oven. But I have read horror stories about Pyrex exploding in the oven. So I must admit, I held my breath while the pudding was bubbling away in the oven, and only exhaled in relief once it had come out. In one piece. Prepare the baking dish (or substitute Pyrex container) by lining with the blob of butter. 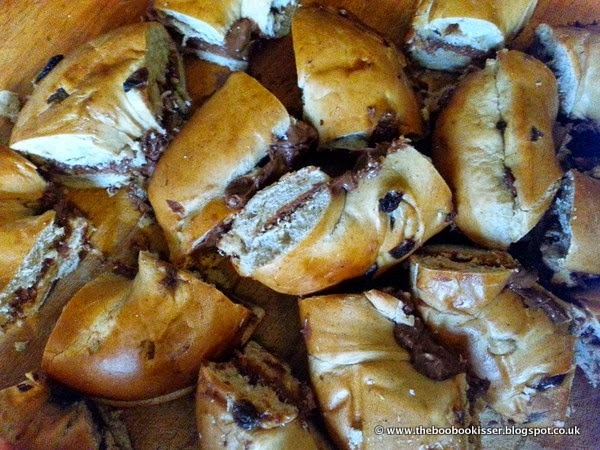 Use the quartered pieces of Nutella-d bagels as building blocks to construct your pudding. Just pile them all together if you are in a rush, or arrange them in neat patterns if you are so inclined. 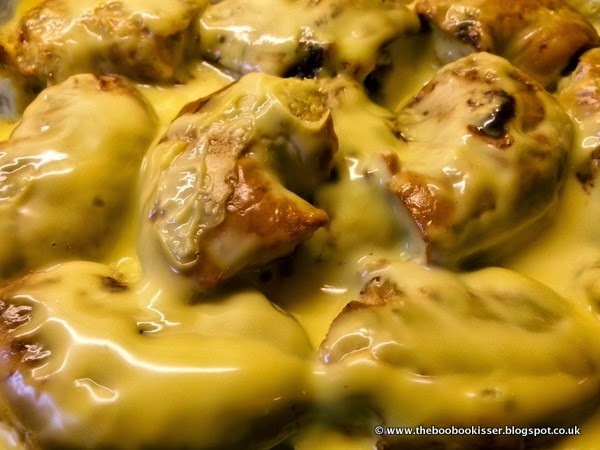 Pour lots of custard all over the bagel-bits, making sure they are thoroughly smothered in oodles of custard. Cover the dish with a piece of baking foil. Bake the pudding in the centre of a pre-heated oven at 180 degrees for about half an hour. The smell of cooked hazelnut chocolate wafting through your home will let you know when it is time to get the pud out of the oven. Let it cool just a little before you dish up and serve with an extra blob of custard for good measure. It may not be much to look at, but there is no denying that a hearty portion of Nutella bread pudding will satisfy your taste buds every single time. Oh WOW, how amazing does that look! I'm all for cooking shortcuts and this sounds like such a great twist on a classic. Gosh, you are killing my diet resolve! Works every time! Will check out the brioche.